There are many things to consider when seeking to buy the best lift for both your needs and your living environment. From the right sling and style to the best function and seat, there are no details too small when contemplating your mobility aids and when it comes to choosing the right sling with the right lift- as well as a range of options to enhance everyday living. 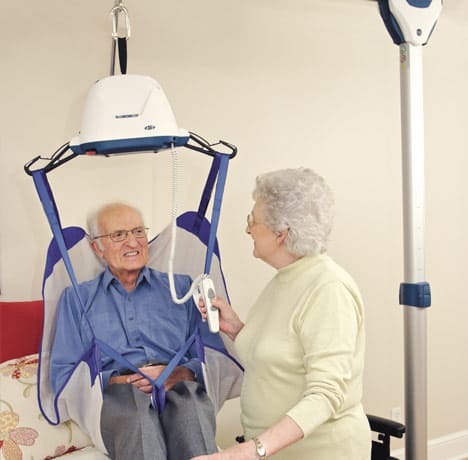 Lifts are used day-in and day-out widely, from hospitals and skilled nursing facilities to homes with in-home care. Depending on the needs of the user, lifts are found in various types to increase access and autonomy. In this state, many of these devices are provided by the mobility professionals at Pacific Mobility; this company is skilled in matching up the best device for distinct degrees of mobility and physical strength, with innovative features that enhance everyday living for those using the products. The first order of business is to determine the type of lift you are looking for, or rather, the right lift for you. You have a lot of choices, including hydraulic powered, electric, and partly-manual, however, usually the medical needs of the consumer point toward the most prudent option. Typically, the most common types of lifts are ceiling-style sling lifts or sit-to-stand lifts, like a stairlift rail system. Quick drying mesh for wet situations, like pools or bathrooms. The style and size of your sling will determine how closely the consumer is to the sides during transfer and how much support is provided. Again, demonstrating and trying equipment is often key to long-term satisfaction. Now there is one standard or Universal Sling found on the market and offered by most major manufacturers. This is considered the most common sling used today in homes and health care settings. This particular design allows users to even operate the lift on their own, though it also provides a level of ease to caregivers, when applicable. This is easily maneuvered from a seated position, like a wheelchair, and provides the head-support that many consumers command with a higher back. It is critical to invest with mobility vendors that offer full-service installation to get familiar with the operation of the lift. This also ensures that you will have service for your lift later when it really counts. It bears repeating that you only want to buy slings, lifts, and other mobility aids from reputable dealers who have experience in offering sales and support of these devices. Installing the lift is critical to its operation and subsequently, your satisfaction with the equipment. This acquisition also merits annual inspections to ensure your lift- or sling- operates effectively for years to come. Also, keep an eye out for brand names that instill a sense of confidence; your mobility retailer will be able to provide more information related to feedback and customer satisfaction with some popular options and brand names. When purchasing the best lift for your distinct needs, also consider the vendor carefully. Invest your time and money with a company that will stand behind the product that they sell, and that is readily available if you encounter an issue or problem. Don’t be fooled into saving money with second-hand or sub-par equipment and mobility devices; these are not only a waste of money but could also present safety risks to those using them. If you are interested in learning more about how lifts and slings can enhance your quality of life, talk to the experts at Pacific Mobility; a team of professionals is waiting to assist you in getting the mobility aids, service, and support that you deserve. Call today.